I'm just going to put this right out there -- I'm fascinated by polygamy. It might be a little strange (although I daresay I am not alone), and my interest has caused me to read a few memoirs as well as watch the entire HBO Big Love series. 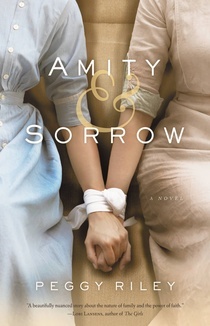 So when I discovered that there is a new novel called AMITY & SORROW by Peggy Riley which tells the story of a mother and her two daughters escaping from a polygamist compound, it was only natural that I read it. All I can say is,"Wow!' Just "Wow!" AMITY & SORROW begins when Amaranth, along with her daughters Amity and Sorrow, crashes her car in rural Oklahoma. Amaranth is escaping from her husband, who just happens to have fifty wives and dozens of children; and she's terrified that he will stop at nothing to find them. A farmer named Bradley, who is reeling from the loss of his wife, rescues them and takes them to his farmhouse. Things are extremely awkward at first between the women and Bradley. (Keep in mind that Amity and Sorrow have never left the compound, nor can they read or write.) However, Bradley and Amaranth find comfort in each other, and eventually they begin to consider themselves a family. It's difficult for me to express how I felt about AMITY & SORROW. There is no doubt that this was an entertaining book that was very well written, but there were parts of the book that I found to be disturbing and a few scenes hit me like sucker punches to my gut. Overall, I'd say I appreciated the novel because I'm not sure the word enjoy precisely captures my feelings. Having said that, I love that the author was able to evoke these feelings in me and it's a huge testament to her writing that I'm still thinking about these extremely complex characters. There are many things about AMITY & SORROW that impressed me, and there is no way that I can touch upon all of them in this review. I'm bound to leave a few out! However, one of the most obvious things is the actual story itself. I've already mentioned that I'm extremely intrigued by the concept of polygamy, and that also goes for the idea of unique religious sects. In this novel, the author created a religion and a leader that were beyond interesting and she managed to bring them to life in such a realistic way. I appreciated how she incorporated some of the more "traditional" polygamy views, but she also created some new rituals that I found to be fascinating like the spinning of the women. Another wonderful thing about this novel was the character development. I found Amaranth and Bradley to be well drawn characters, and I liked the dynamics between them. Furthermore, I thought Amaranth's husband and leader of the polygamist compound was presented as a real (and very creepy) character. However, it was Sorrow and especially Amity that really fascinated me. These two sisters knew basically nothing outside of their little world on the compound. They were deliberately sheltered and had so much fear instilled in them that they really couldn't function in the real world. I absolutely loved how Ms. Riley juxtaposed the two of them. Sorrow, the older sister, had absolutely no desire to leave the compound or to be separated from her father (she even had to be tied to her sister so she wouldn't run away); while Amity, the twelve year old, seemed much more curious and ready to embrace what her new life had to offer. Finally, I'd be remiss if I didn't mention the writing style and the unique way the story was presented. The novel was written in the present with flashbacks to the past. I liked how these flashbacks allowed me to better understand the characters as well as their life on the compound. In many ways, these chapters answered various questions that kept popping up about these three women and why and from what they were escaping. In addition, the actual prose of the story was very original and unlike anything I can remember reading. Ms. Riley's writing is beautiful and almost poetic. I especially liked her descriptions of the Oklahoma land and Bradley's farm, and how she tied it to Steinbeck's GRAPES OF WRATH. AMITY & SORROW would make an excellent book club selection. The story is riveting and there is so much to discuss about these very complicated characters. I wasn't able to find a formal reading guide, but don't let that deter you from considering this novel. Some of the themes you might want to explore include love, marriage, forgiveness, religion, faith, mother/daughter relationships, family dynamics, and redemption. It might also be interesting to talk about the various symbols that appeared in the story. AMITY & SORROW is truly a beautifully written book that will also make you think. Highly recommended! I agree that there's a lot to talk about. I haven't finished this yet, but I'm caught up in the story. I know what you mean when you say it's hard to say "enjoy" sometimes even if a book is good! Count me as one of those people fascinated by polygamy. This book left me feeling sucker punched a time or two as well. I love books with well thought out twist and turns, which is what this one sounds like. Thank you for a very informative post. I absolutely loved Amity & Sorrow! I think that Peggy Riley did such a great job talking about the after-cult life, in a dark but understandable way.